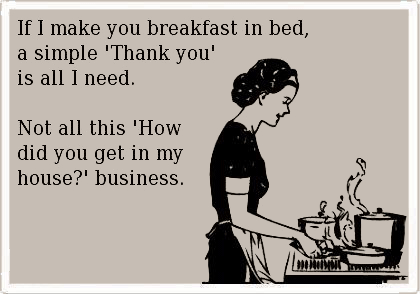 If I make you breakfast in bed, a simple “Thank you” is all I need. Not all this “How did you get in my house?” business. Created about 6 yrs, 1 mth ago (February 27, 2013). Updated about 6 yrs, 1 mth ago (February 27, 2013).